How do I enter Agistment Income in an Advanced Budget? 1. Setup an enterprise for Agistment and set the Enterprise Type to Other (not Livestock), via the Setup/Enterprises/Names menu option in Cashbook. 2. Have a Product setup for Agistment Income. 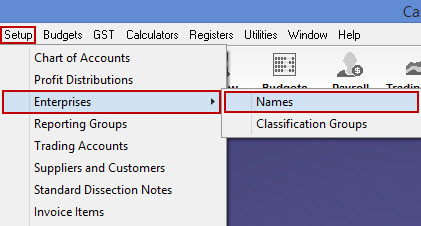 In the Advanced Budget click on the Setup/Product Item List menu option and click on Add. 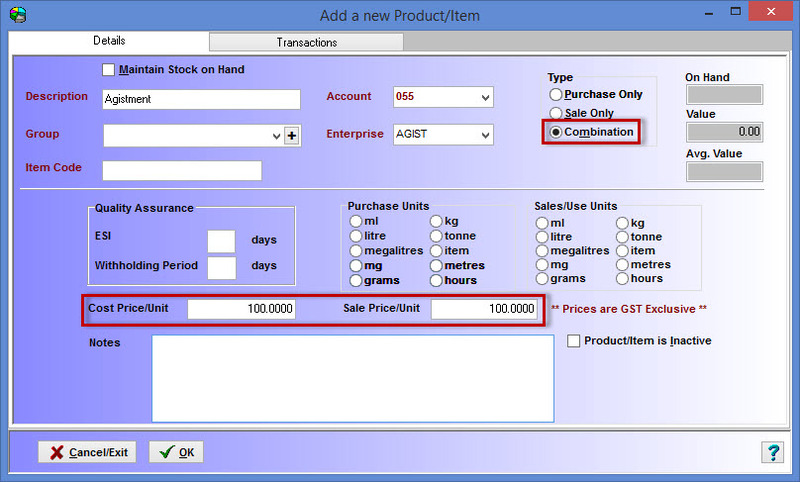 Enter the Type as Combination and enter the Cost Price/Unit to be the same as the Sale Price/Unit. The price you enter here is the income per head per day/week. If you have different prices per class of animal then setup different prices per class. EG: cows & calves, then weaners, then dry cows. 3. Go to the enterprise in the Advanced Budgets and then in the Income section select the income account code and change the enty type to Worksheet. 4. To enter income, double click on the required month. • Treated is the number of animals currently on agistment. • Product/Activity is the product created earlier. • You can enter a brief description to show who owns the animals being agisted.